Plastic has become a major environmental concern and with rising awareness the demand for recycling plastic is catching pace. In the past few years, several companies have entered the global plastic recycling market. Though vastly spread, the global plastic recycling market is highly fragmented due to the presence of several unorganized and small players in underdeveloped countries. Eyeing potential for growth, several global brands are looking to enter fast-developing regions of the global plastic recycling market. As a result, many leading brands are exploring opportunities to procure smaller companies to enter these regions. 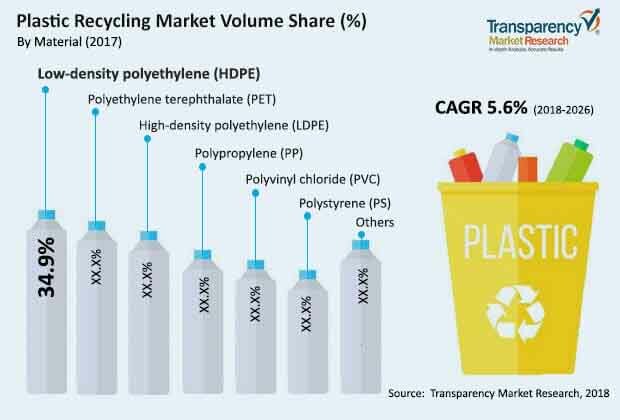 Some of the prominent brands in the global plastic recycling market are KW plastics, Kuusakoski Oy, Envisison Plastics, and Plasgran Ltd.
With the global plastic recycling market buzzing with business, Transparency Market Research has come out with a report that lays down all pertinent details for existing and upcoming players. According to the TMR analysts, global plastic recycling market was valued at US$34.8 bn in 2017, and is predicted to grow at a strong CAGR of 6.8% during the forecast period. When it comes to segments, the demand from the application segment will steer growth during the forecast period, point out TMR analysts. It is augured that companies in the packaging sector will account for the largest consumption in the coming years. On the other hand, Asia Pacific will emerge as the leading geographical segment in the global plastic recycling market. For a long time, plastic has been dumped under the ground or inside the ocean. This causes depletion of flora, affects the ecosystem, and disturbs the ecological balance. Many scientific reports have pointed out this, and a good example is the death of corals in the Great Barrier Reef in Australia. At the same time, it also has an impact on the soil, and results in health hazards. Realizing the harmful effects, many countries have adopted laws that progressively aim towards zero plastic waste generation. One of the steps include ban on dumping plastic in landfills. Countries are recommending consumers and industries to use recyclable plastic, and this will give way for growth in global plastic recycling market. With most industries that are large-scale consumers of plastic mandated to use recyclable plastic, the demand in the global plastic recycling market will rise in the coming years. While large number of nations have recommended using recyclable plastic, they are also promoting the need to use paper which is a green material. This poses threat to the global plastic recycling market. Many brands prefer using paper to pack their products or paper bags. This may worry the existing and upcoming players in the global plastic recycling market. However, the high cost of paper bags will continue to boost demand for recyclable plastic bags, thus aiding growth in the global plastic recycling market. Paper bags are expensive than recyclable plastic bags and hence it might prevent consumers from purchasing them. Further, development of new materials for making recyclable plastic bags will create fresh opportunities in the global plastic recycling market. These materials are aimed to reducing the time, money, and efforts needed to recycle plastic.